Hey there, gang. I just found this on animenewsnetwork.com. The 70’s generation should enjoy this. Finally took the plunge and got us a Twitter account! No guarantee’s we’ll post there anymore than we do here, but follow us anyway! You only wish you were this awesome. 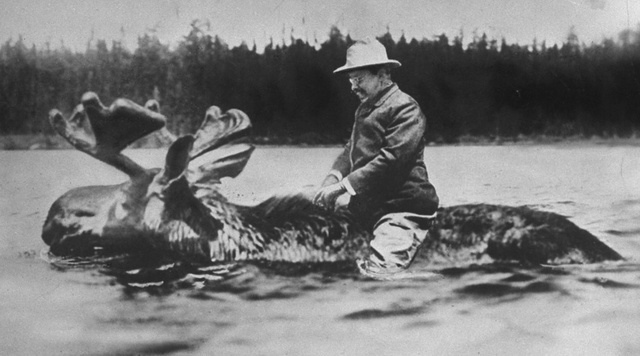 Here’s a picture of Teddy Roosevelt riding a moose. After a long and unplanned absence, the Mid-Life Crisis Taskforce returns with an all-new episode!! Today, we get caught up on why we were on hiatus, what we’ve been doing in the meantime, Rando talks guns, we say RIP to Russell Johnson, and we discuss who’s make a pact with the Devil. Guess what we did tonight? WE RECORDED A PODCAST!! WOO-HOO!!! Should hopefully have a new show up soon. Stay tuned! Oh my God, It’s 2014! Hang on to your knickers, folks. We’ll be back in form soon!